Today I read a small, interesting book called a Technique for Producing Ideas. It was recommended to me by one of my Columbia Professors. The book was written in 1965 by James Webb Young, an Advertising man. You get the sense this book was written during the “Mad Men” times. Advertising was an art. A creative endeavor. 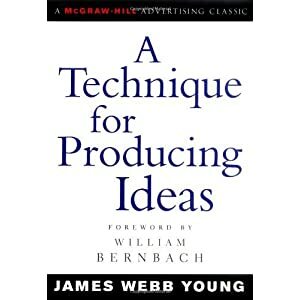 Webb Young lays out two principles of idea creation before going into the Method. It’s a very short book at less than 50 pages, and the font is big which means its a fast and easy read! The book is likely of interest to entrepreneurs, marketers, and creators of all types. You can buy the book here.